Over Memorial Day weekend, I went bike camping for the first time. 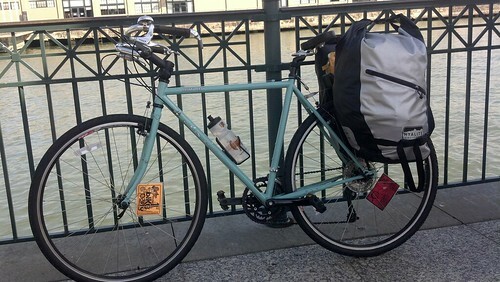 Voici my trusty steed Seabiscuit all loaded up and ready to go! Inside the panniers were: a lightweight one-person tent, a sleeping bag, a thermarest mat, a change of clothes (which doubled as a pillow), a couple snacks, a headlamp, travel sized toiletries and a few more camping doo dads. 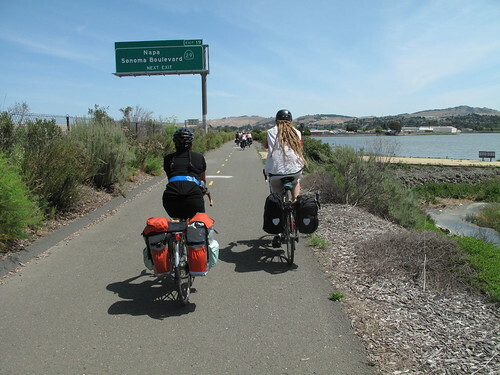 I also used this list on Bicycle Touring Pro to help me pack. You can also glimpse a corner of my po campo purse that I hooked onto my rear rack which carried my wallet, sunblock, lip balm, camera, phone and keys. Luckily I was not alone on this adventure. 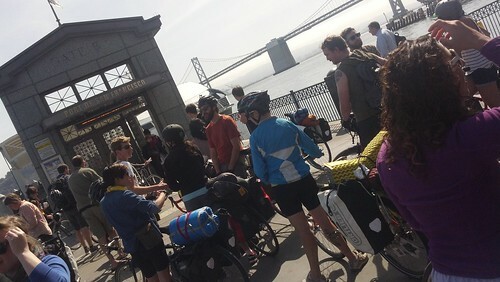 I joined a group of 20+ bikey friends and so we had plenty of seasoned campers along on the ride who also brought essential camping gear to share. As you can imagine, we made quite an entrance wherever we rolled through! 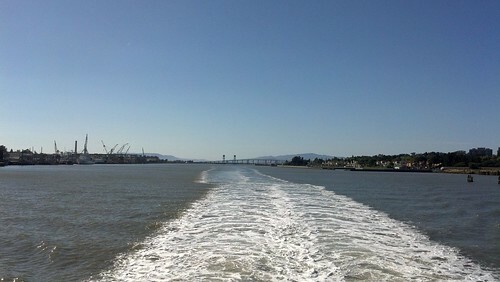 To slice a few miles off, we took the ferry from San Francisco to Vallejo. 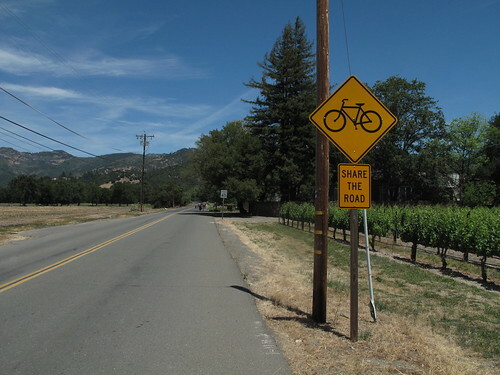 The rest of the ride was fairly flat and, as always on a bicycle, I got to see corners of the Bay Area I've never witnessed before in an up close and personal way. 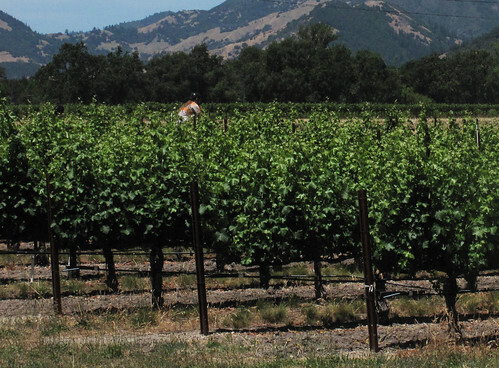 The most beautiful part of the trip was when we arrived on the Silverado Trail which meandered through vineyards. 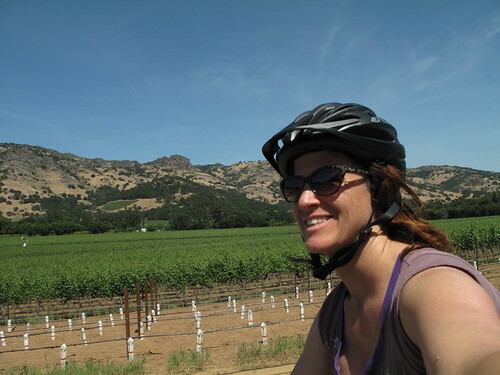 I decided to wear a helmet for this ride because I was carrying a heavy load and our route has a tendency to be windy with occasional gravel, so I wanted additional safety measures in case I lost my balance. I knew it was going to be hot, but spending hours pedaling with a heavy load in 90+ degree temperatures is grueling. I would recommend a shorter ride in cooler temps for other bike camping newbies. Also, fit some extra water in your panniers. I'll do that next time. 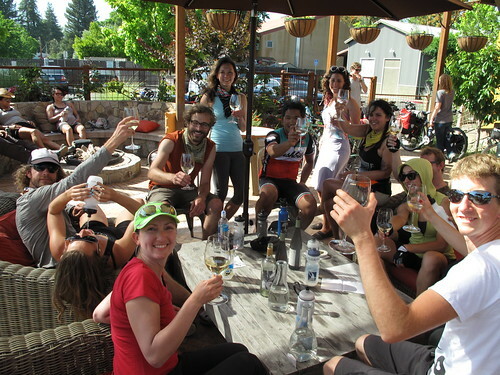 So it was joyous and momentous when we finally reached Velo Vino, the wine tasting café owned by Clif Family. 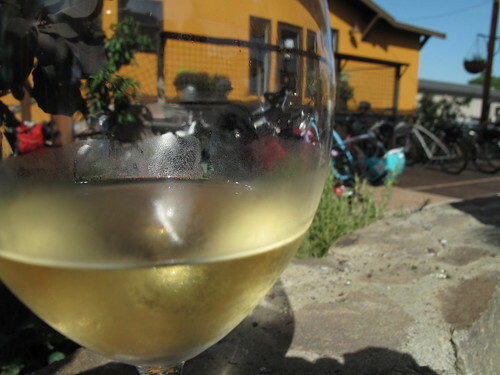 It's an excellent pitstop for bikey people. 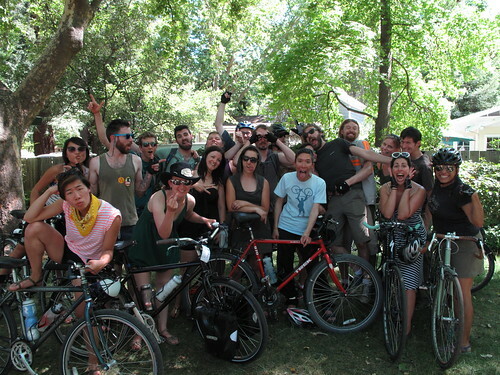 The staff was welcoming and accommodating to our large and rowdy group. And their wines are tasty! Very refreshing on a hot, sunny afternoon. When we finally arrived at Bothe State Park, I set up camp ASAP before it got dark. One of my campmates noticed that my bike, tent and beer can were color-coordinated. But of course, I'm Vélo Vogue! 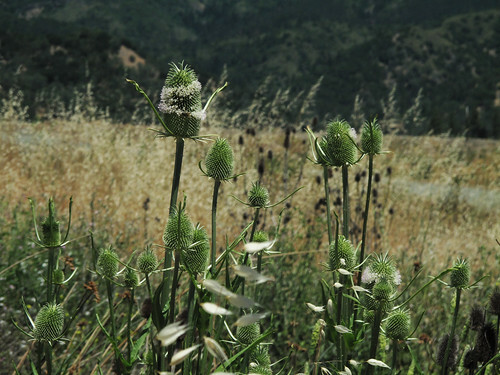 One of the best parts about camping is the chance to meet and spend quality time with kindred spirits. 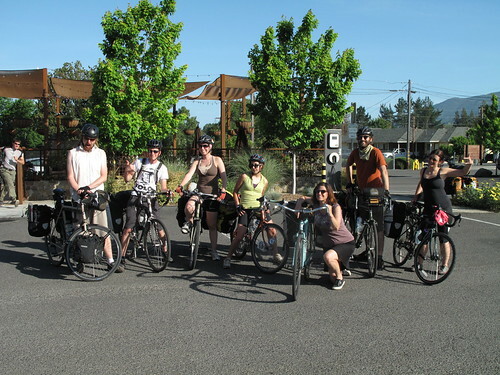 I made lots of new connections with inspiring people who are open to challenging themselves with new bike adventures, who also know that getting there is all the fun. 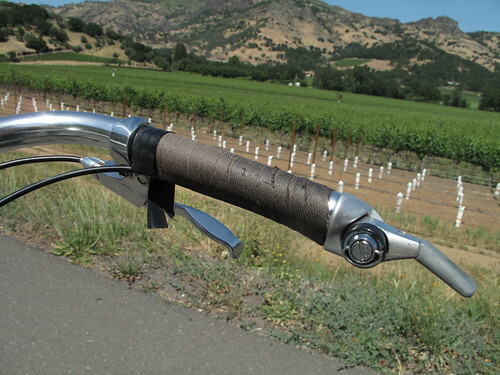 Thanks for the bikey memories, Napa! 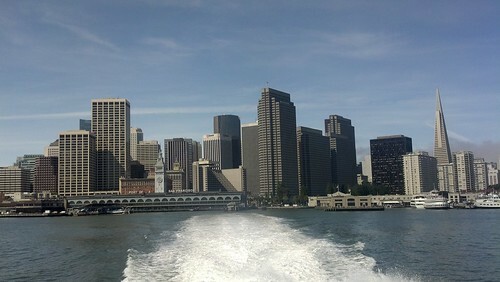 I'll be back soon! 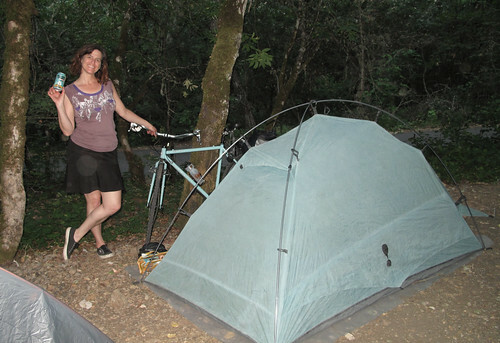 For more bike camping tips, watch my friend's how-to video for beginners here.